Ships from Hong Kong. 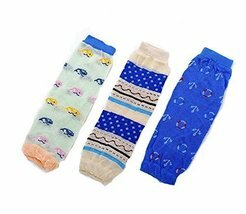 This cute baby Leg Warmers is with lovely unique styles! This leg warmer is going to look too cute on your little baby. Material Composition: Cotton and Lycra. It is Free size and One Size - Approximately 11 inches (28 cm). Recommended for baby 0-3 years old. For Newborn Babies - normally covers entire leg; For Toddlers - normally covers from ankle to mid-thigh. Preschoolers - normally covers from ankle to knee. It is also great as arms warmer for Small Adolescents/Adults. And it is also a perfect gift choice.